Epitomising casual elegance and traditional luxury - Oriental Residence Bangkok offers refined accommodation surrounded by a lush enclave in the centre of the city. Unparalleled attentiveness and cordial service attracts business and leisure guests, alike to this Bangkok serviced residence. 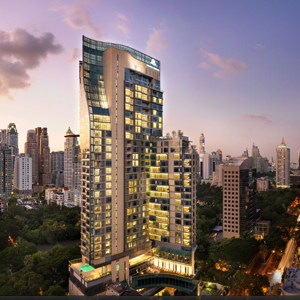 Featuring 145 lavishly appointed serviced residences ideal for extended stays, a signature Chinese restaurant, the chic Café Claire, the Play Deck, and diverse function facilities - Oriental Residence Bangkok embodies a tradition of personalised excellence. Satisfying the needs of discerning residents - Oriental Residence Bangkok unites comfort and exclusivity with personalised service and precision - exemplifying refined indulgence in the unique tree-lined heart of Thailand’s luminous capital. From Chidlom BTS Station, take a taxi down Langsuan Road and turn left on Soi Sarasin. Turn left again onto wireless road and go straight. The Oriental Residence is just past the Embassy of The United States.